PHILADELPHIA — They’re purple, packed with flavor and “beeting” kale in a superfood showdown. Love Beets – a delicious line of premium, all-natural, ready-to-eat beets – announced the launch of its first organic marinated baby beets, along with a brand new line of natural beet juices with no added sugar. Both Love Beets products are beginning to roll into grocery stores across North America, turning beet skeptics into beet lovers. Love Beets’ new Organic Baby Beets in Organic Mild Vinegar start with the freshest baby beets that are steamed to tender perfection and marinated in organic red wine vinegar to complement the beets’ sweetness. They are gluten-free and contain no artificial colors or preservatives. Love Beets’ new line of gluten-free beet juices is available in two thirst-quenching flavors, Super Tasty and Cherry & Berry. Super Tasty Beet Juice offers a rich, naturally sweet taste with just a hint of earthiness, while Cherry Berry Beet Juice blends the sweetness of beets with the fresh tartness of berries and cherries for a unique flavor experience. Both juices are made with 100% juice and contain no added sugar, artificial colors or preservatives. Virtually fat free and low in calories, but rich in potassium, folic acid, and antioxidants, beets are quickly emerging as the next superfood. They promote heart health, help lower blood pressure and LDL or “bad” cholesterol, and improve exercise performance and stamina. Incorporated into a diet rich in vegetables and fruits, they are an important part of maintaining a balanced and healthy lifestyle. Love Beets’ new products join its existing line of delicious marinated baby beets, with flavors ranging from Honey-Ginger to White Wine & Balsamic Vinegar and Sweetfire, and its ready-to-eat steamed beets vacuum packed for freshness. And with Love Beets, there is no longer a need for time-consuming preparation and messy scrubbing – consumers can easily transform Love Beets into a tasty appetizer, salad-topper, main course or even dessert. 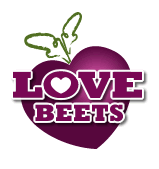 For more information about Love Beets, visit www.lovebeets.com. Launched in 2010, Love Beets is a line of premium, all-natural, ready-to-eat beets sold in major retail food stores across North America. Products include marinated baby beets, vacuum-packed steamed beets and beet juices. Love Beets products use no artificial colors or preservatives, are mostly gluten-free and select products are certified organic by the USDA and certified Kosher.